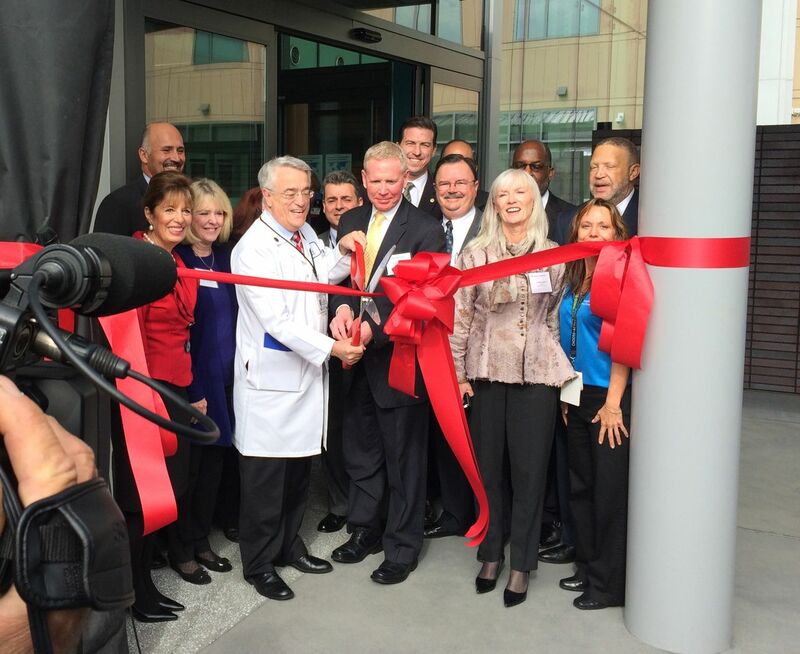 November 21, 2014 | by Darcy Blake | Kaiser Permanente Redwood City announced the grand opening of their new hospital today at a VIP ribbon-cutting ceremony. Speakers included Bernard Tyson, national CEO of Kaiser Permanente, Greg Adams, regional executive of KP Northern California, Dr. Robert Pearl, CEO, The Permanente Medical Group, Dr. Jim O’Donnell, Physician in Chief, Frank Beirne, Senior Vice President & Area Manager, San Mateo Area, Congresswoman Jackie Speier as well as many other officials. I was honored to receive an invitation to speak, and the following is my speech. Last week, I threaded a needle. You may think that is no big deal, but I haven’t threaded a needle in about 6 years. Details like this make me happy. In 2008, I was diagnosed with Parkinson’s Disease at Kaiser Permanente/Redwood City by neurologist Dr. Edwin Garcia. For three years, it wasn’t much of a tremor, but it became more pronounced and so I tried medications. I’m an exception in the world of Parkinson’s Disease because the meds didn’t help me and they made me very nauseous. After trying meds with a worsening tremor, and a dragging leg called dystonia, Dr. Garcia suggested surgery called Deep Brain Stimulation. I went through a thorough screening process and had DBS 1.4 years ago. The master of details for my surgery was neurosurgeon Dr. Mark Sedrak. Not only did he do an outstanding job on my brain, he masterfully mended my scalp and went over and above the standard of excellence in DBS surgery. Thanks to Dr. Sedrak, my movement disorder specialist Dr. Rima Ash and the neuro team at Kaiser Permanente, I have drug free, 100% success. I will be the captain of the Parkinson’s Women Support team that will walk at the National Parkinson Foundation Moving Day in Silicon Valley on April 25. True to form, Kaiser Permanente Redwood City is taking a role in Moving Day, thanks to Physiatrist Dr. Raymond Quesada whose revolutionary concept of a specialized exercise community for PD in the Bay Area is becoming a reality. And speaking of being at the forefront, Kaiser is also taking a leading role in refining the hospital experience for patients and their families with the Family Advisory Board for the Neurology Department. As a member of this group, I’m happy to say that program manager Jodie Ruland, Neuroscience Nursing Manager Michelle Brown and our team are creating a host of improvements to make a Kaiser hospital stay a welcoming experience. As you look around at the new hospital, you can see the attention to detail that went into the design of the building. This appreciation—that quality is in the details—is shared by the Department of Neurology. I am so pleased that now they can work in surroundings that match their excellence. Thank you.